Gil did a great job on the kitchens in both of my houses that were flooded by Harvey. He was attentive and fairly price at a time when so many others were taking advantage of flood victims. I highly recommend him and will use him again, should the need arise. Gil and his team were very professional and did everything that he said they would do. I would recommend Stylish Cabinets to anyone building a new house or remodel. I would highly recommend this company. I had one of the best experiences of my life. They made it so easy to visualize and decide what we needed to do in order to get the project done. Gil is very polite, respectful, honest and easygoing. We hired Stylish Cabinets thru our contractor, right after Hurricane Harvey. The owner, Gil was compassionate about our situation. We worked with him to have all new kitchen cabinets, bathroom cabinets, along with some extra built-ins. He took measurements, then sent us drawings of what the cabinets would look like, we had to tweak some due to changes that we made. Gil was so easy to work with, that made one less problem with Harvey, no longer a problem! He checked in during installation process and made any additions, that I wanted very easy! I would not hesitate to hire him all over again! Great workers. Clean installation. Work completion done on time. Good design, a great improvement over the cabinets they replaced. Would use them again if needed. Great Job!!! Top notch workmanship and service. From the very beginning Gil was responsive to our needs, our desires, our budget, and our schedule. He came to our home to look at our kitchen and bathroom projects and to give us direction. He also provided us with several options to meet our pocketbook. He was very upfront with all cost and there were no surprises. When it came time for the install, the crew was punctual and professional and their attention to detail was impressive! Gil always made us feel like our project was the important job he had and he never rested until we were happy. The level of customer service provided by Gil was really incredible, the kind that is rare in today’s busy world. Thanks Gil!!! Highly recommend Stylish Cabinets. They installed kitchen, baths, and living room cabinets after my home flooded. Very professional, efficient, and friendly. I especially like the corner unit in my kitchen as well as the pull out spice rack and the big, deep drawers. Wish I would have selected even more drawers. Love them. Local business who does it right! I just wanted to say thank you very much for all of your help throughout this process. You and your team were incredibly helpful and very easy to work with. We’re very happy with the way everything turned out! Give us another couple of weeks and then feel free to stop by to take pictures! Thanks again, and it’s been a pleasure doing business with you. Stylish Cabinets was recommended to me during the rebuild of my home after Hurricane Harvey. I am so grateful because the company has a wide selection of beautiful cabinets that are affordable. The quality of the cabinets are exceptional and they are well made with features like self closing drawers and doors. One of my favorite features was the matching appliance panel I purchased to hide my dishwasher. Very cool!! The cabinets accent my granite and quartz beautifully. The best thing about Stylish Cabinets is the owner Gil who is trustworthy and honest. He understood my financial situation and gave options that fit in my budget. He takes pride in his company and the customer service they provide. Not only did he make sure I was very happy, but he always makes sure the cabinets and installation are up to his impeccable standards. Thanks Gil for guiding me during the rebuilding of my home with beautiful cabinets. I want to thank Gil Isgar and his team at Stylish Cabinets of Katy, My house was damaged from Hurricane Harvey, my kitchen and bathroom was ruined. Gil came in, walk in damaged kitchen and told me he could put my kitchen back together and make it better than it was before the flood. Gil had so much patience with me and worked within my budget to give me a beautiful kitchen and bathroom. Gil provided excellent services at a very fair price for two of my houses flooded by Harvey, at a time when many contractors were taking advantage of flood victims. I would use his services again in a heartbeat, and highly recommend him to my friends. Gil and team did a wonderful job and we love our cabinets. Gil helped us understand the options and made sure the measurements through installation were perfect. Of all of the different contractors involved in the renovation our house, Gil was the best! Despite having ordered the cabinets as a result of the flood and the unusual demand that stylish cabinets had to cover, Gill Isgar made sure that the work was completed and the details were completely corrected. The patience to visit our house a number of times despite the high demand, make Stylish Cabinets stand out as the best service provider we had to rebuild our house. Stylish Cabinets is the ONLY way to go. Gil and his team really took care of us. We stoped by the show room , looked around, got a few ideas, told Gil our budget and now i;am ecstatic to say that I have my DREAM kitchen!!! We changed the floor plan a handful of times and Gil was there to guide us in a way so that our kitchen was as functional as possible. I genuinely can’t say enough positive thing about our experience with them. If you’re looking to remodel your kitchen, bathroom or add cabinets to your laundry room stop by. I promise you won’t be disappointed! 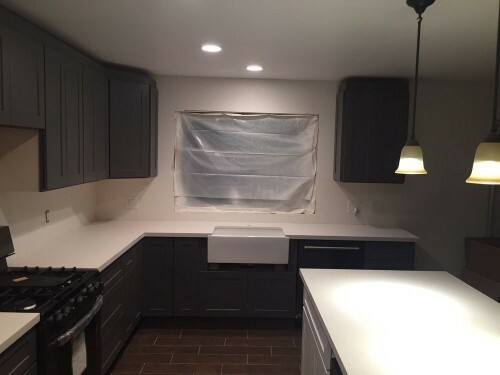 Love the gray shaker cabinets with the White Island! Working with Gil to remodel our dream kitchen has been an absolute pleasure. Always responsive and patient throughout our many design changes. We always felt like a priority at every step of the process. Stylish Cabinets was the best decision we would have made. Having cabinets installed by Gil at Stylish Cabinets was a wonderful experience. He and his crew are very professional and extremely knowledgeable. I had no problems whatsoever. I love showing off my beautiful cabinetry, especially those that are glass-fronted. I highly recommend this company! Recently had Stylish Cabinets provide new cabinets for two bathroom updates. Great customer service, timely, and most importantly…new, beautiful cabinets with full extension and soft close! Loving the cabinets and customer service! Deciding to remodel our kitchen and bathrooms was a big financial decision for us. Gil, at Stylish Cabinets, walked us through the process, was very professional, quick to respond to any questions or concerns, and a pleasure to work with. We absolutely love the results. Quality cabinets and a personable and professional salesman. We couldn’t be happier with our decision to go with Stylish Cabinets and highly recommend them to anyone in need of cabinets. Gil did an AMAZING job and was hands on through the entire process. He was patient and took extra time with me when I couldn’t make final decisions on pulls. I would highly recommended Stylish Cabinets. We recently remodeled our entire kitchen, and we’re thoroughly pleased with the exceptional quality of the cabinets. Gil Isgar, patiently worked with us, and came out several times during the installation, assuring the quality. Fantastic organization. We absolutely love our new cabinets! Everyone who has seen our kitchen transformed has been wowed. Gil did a great job working with us to get the most out of our space and checked in the job daily, often making runs to get more materials to make the job more efficient. Gil was very professional and went out of his way to make sure all the cabinets we ordered were the right sizes and they would fit in the proper place to the measurements. After we received our cabinets Gil made a follow up visit to make sure everything was to our satisfaction. I highly recommend Stylish Cabinets for every new Home construction or a remodeling job. Thanks Gil for making our kitchen and bathrooms so beautiful. 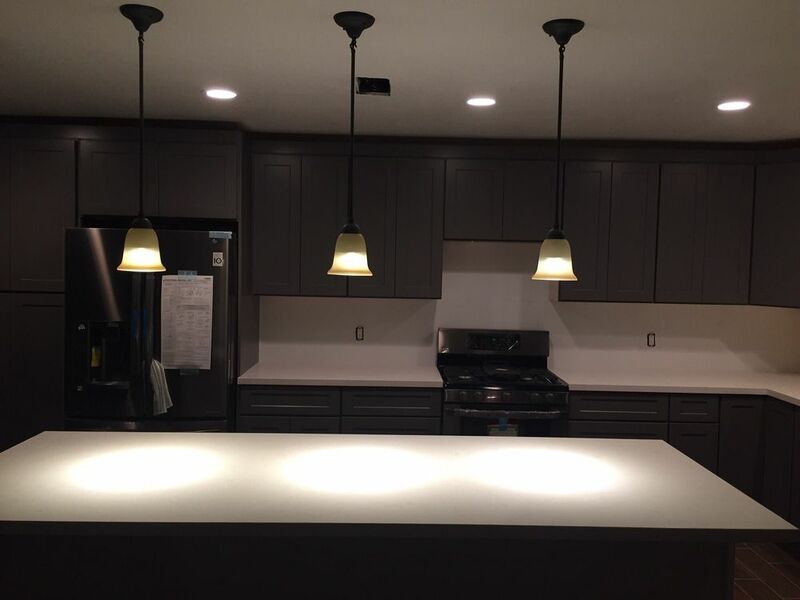 “Beautiful cabinets and very affordable! We have remodeled our town home and installed these cabinets in all three bathrooms, the kitchen, and the living room! The name of this company fits it to a T! They are very stylish! Gil was very helpful in helping us with the correct sizes and the design we were looking for! I highly recommend this establishment to everyone that is wanting to update their kitchen and bathroom cabinets!